Chef Macquet has a decidedly diversified new-world taste. 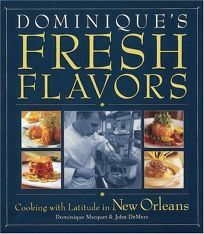 His debut cookbook features plenty of French foie gras and goat cheese to be sure, but kaffir lime, couscous and Japanese beef also play major roles. However, the recipes are neither simple nor inexpensive. For example, a pricey Lobster and Foie Gras Terrine appetizer that involves a vinaigrette of chanterelle mushrooms, pistachio oil and ostrich consomm is nothing less than tough to make. He also marinates a goose breast in lavender and skewers poached and crisp-seared veal innards with six-inch stalks of sugarcane. There are 14 clever seafood offerings, several with Asian touches of lemongrass or Chinese mustard, but none is as stunningly multicultural (Dutch-Russian-Japanese) as the Aquavit-Citrus-Cured Salmon with Osetra Caviar and Wasabi Cr me Fraiche. If the sweet tooth begs, there are a baker's dozen desserts, including, at last, a refreshingly simple concoction: Mango Sorbet. Just water, sugar and mangos. Pur e until smooth. Freeze until stiff (Jan.) Forecast: Drawn from his work at the New Orleans restaurant that bears his name, the foods here are, indeed, high art. Nevertheless, while fame will draw readers to this book, it is not for the less-than-confident cook.